This photomicrograph shows a bronchus with increased numbers of chronic inflammatory cells in the submucosa. 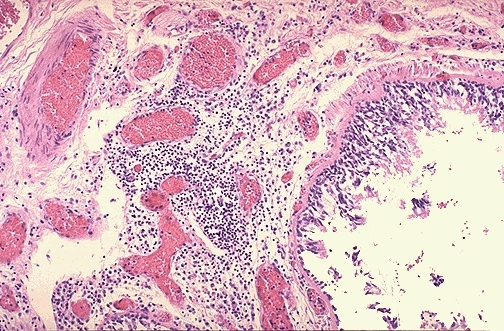 Chronic bronchitis does not have characteristic pathologic findings, but is defined clinically as a persistent productive cough for at least three consecutive months in at least two consecutive years. Most patients are smokers. Often, there are features of emphysema as well. Since chronic bronchitis and emphysema often overlap, the term 'chronic obstructive pulmonary disease' (COPD) can be applied.